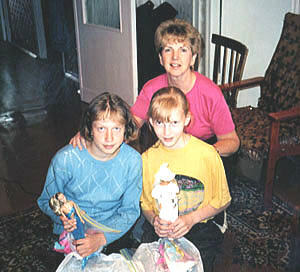 Pauline Mayhew looks on as her host's daughter and a friend play with their first Barbie dolls, which Pauline has just given them. Photo by Jack Mayhew. 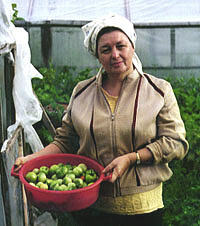 Zina Yeogorova holds a tub of green tomatoes in her garden at her dacha. 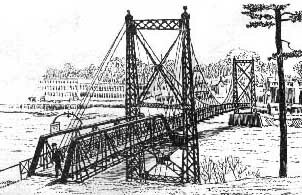 Photo supplied by Earl & Mary Coombs. 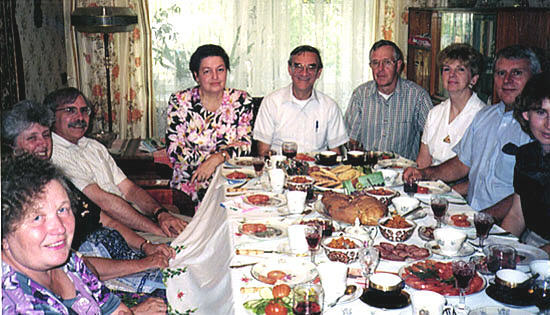 From left to right, an unidentified Russian, Patricia Hanson, Earl Coombs, Zina Yegorova, Phil Gonyar, Mike Whitcomb, Pauline Mayhew, and Jack Mayhew have tea and treats in Inna Tushina's apartment. Photo supplied by Jack & Pauline Mayhew. Two derelict "ships" float on a sea of grass near Krasnoborsk. Photo supplied by Jack & Pauline Mayhew. 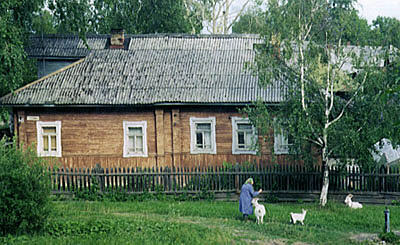 An old woman feeds goats in front of an old house in Kotlas. 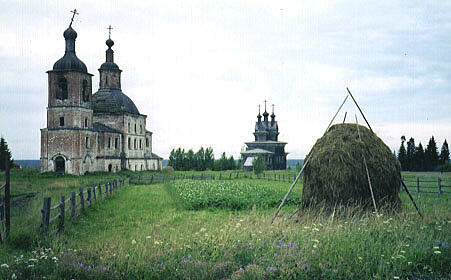 A "gingerbread" house in Veliky Ustyug. 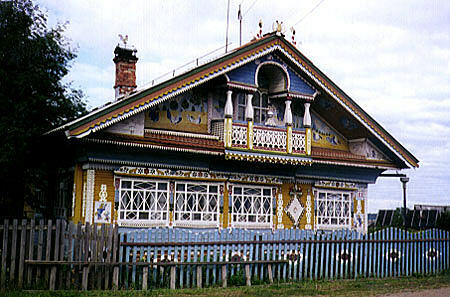 Although the decorations here are more elaborate than most, such ornamentation is not unusual on houses in northwestern Russia. 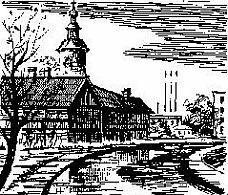 Photo supplied by Earl & Mary Coombs. 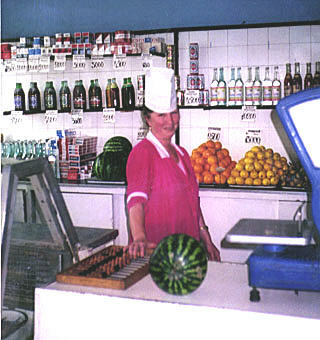 A clerk stands behind a counter a grocery store. As in most Russian stores, all goods are kept behind the counter. Note the Y2K-compliant computing device on the counter. 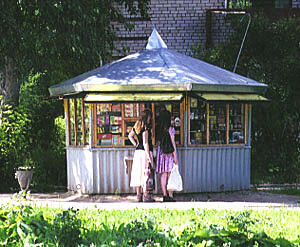 The street corner kiosk, common in Russian cities, is the Russian version of a convenience store. Such kiosks typically sell newspapers, tobacco, a few foods, and, of course, vodka. Grocery photos supplied by Earl & Mary Coombs. 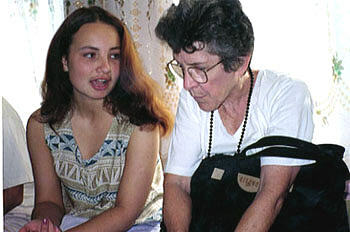 Former exchange student Lena Vologdina (L) talks to Ruth Engle on the train leaving Kotlas. Train photos supplied by Earl & Mary Coombs. These two young ladies were attendants on the train to St. Petersburg.